Finishing as high up the table as possible rather than the imminent arrival of new boss Joey Barton is the focus for Fleetwood Town keeper Alex Cairns. 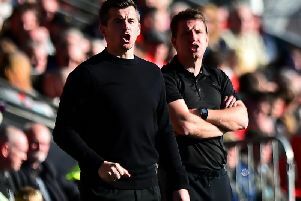 Barton was in the stands for Town’s 4-0 loss to Wigan Athletic last time out but, as they prepare for the final two games of the season, Cairns hopes the new manager saw some positives. He said: “I didn’t know he was watching! “But I think he will look at that defeat and pick out the positives and seeing what he can do with the team next season. “I think we have got to focus on the next two games then we will meet the gaffer at the beginning of next season and see what he is going to bring to the table. “Right now everyone is focused on putting the next two games right and finishing as high up the table as we can. It has been a year of learning for Cairns in his first full year as a first choice keeper. He started the season as Uwe Rosler’s number one but after a confidence-sapping poor run in December he found himself out of the side as Chris Neal took his place. Just before Rosler went in February Cairns had reclaimed his spot in the starting XI. He has since rebuilt his confidence under Rosler’s successor, John Sheridan, with six clean sheets. And now the keeper is looking forward to kicking on again next season and learning more from goalkeeping coach David Lucas when Barton takes over. He said: “It has been a big learning curve for me this season. “I think I have manned up. I think I have stood up and been counted when I have needed to be. “Being out of the team was hard and difficult but Chris is a very good goalkeeper and he deserved to be in at that time.